This album spread is showing the bride being escorted down the aisle by her brother at an Atlantis Banquet Hall wedding and the reaction of the groom. To capture the processional I am usually positioned in the middle of the ail and photograph the bride walking towards her groom. I wait for the bride to pass and then, I photograph groom's reaction over the bride's shoulder. In the left image, the bride is shown being walked down the aisle by her brother. 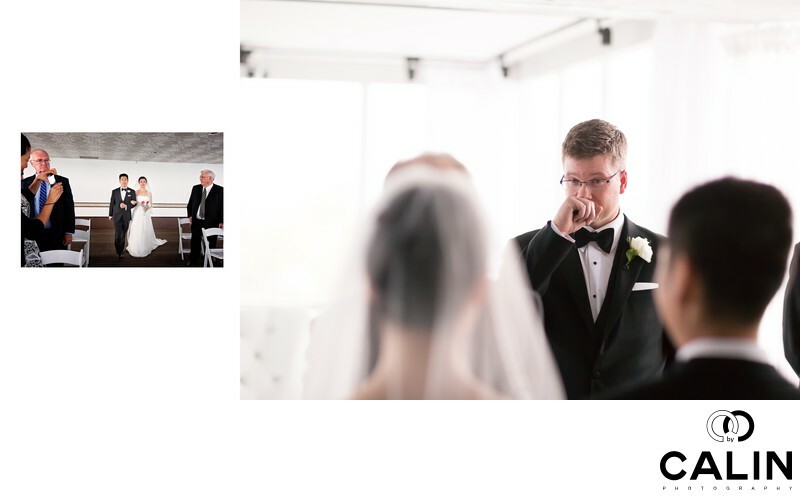 In the right photo, the groom is framed by the bride on the groom's left and by her brother on the right. The groom is crying. The biggest challenge at this venue was the fact the scene was backlit. That poses an issue as photographic equipment have a tendency to miss focus or in wedding photographers' words to hunt. That refers to the movement of the lens' front element back and forth trying to focus. This image features Atlantis Banquet Hall, a spectacular wedding venue in downtown Toronto.